Reminiscient of a small toaster, the Netgear SC101 provides a simple method of employing file storage and backup on a network. Whilst physically it does look alarmingly like a toaster, it does differ slightly in that there are no slots in the top for the bread. The back of the unit has a single RJ45 port and socket for a PSU. The front of the unit sports three LEDs (to show the power is on as well as network and disk activity) and a small 'screw-lock' for access to the drive bays. The SC101 can house up to two disks, which must be ATA IDE drives, that need to be purchased separately. It is also worth checking the Netgear compatibilty list before purchasing these. These can be accessed as two separate physical drives or can be set up as a mirrored pair. Alternatively, it is possible to partition some of the drive capacity as a normal drive whilst using another partition as a mirrored drive in a pair. Management of the unit is performed using the SC Management Utility thru' Windows where drives can be partitioned, formatted and setup as mirrored or non-mirrored. There is also a DOS-based utility called UT that can be used to list partitions or delete them. The SCM utility can also be used to assign drives to the Windows file system so that they appear as conventional local drives both in Explorer and in the Windows Disk Manager. The SCM utility is also required for use on client PCs to allow them to access the data on the SC101, although it is perfectly possible to share the SC101's drives via MS Networking, much like any other drive. Hooking the SC101 up to a network is quite a simple affair, just connect an RJ45 cable between it and a router or switch, then power the device on. There must be a DHCP server available on the network as it is not possible to set a fixed IP address on the unit. Once the device has booted it is possible to manage the unit using the management utility. Note that it may be necessary to open the necessary port for the SC101 in any firewalls running on the management PC, specifically UDP port 20001. The following diagram shows some possible deployments for the SC101. The SC101 can also be used across a wireless network but be aware that this can be slower than when a wired connection is used, depending on the speed of the wireless connection. The first screen proper offers the choice of running either Wizard or Advanced configuration. The Wizard configuration just runs thru' the necessary steps to configure partitions or manage existing ones, whilst the advanced mode allows the modification and views of the status of drives, as well as the ability to create new partitions. The following screen dumps are a step-by step view of the Wizard setup of a drive. Next, the Wizard will ask if Mirroring is required, then prompt to set the drive as either shared or non-shared. Setting a drive to shared allows it to be accessed by other PCs on the network that are running the SCM utility. Finally, the drive will be set as shared and/or mirrored (if configured) then assign a drive letter for use with Windows. Note that the SCM will allocate the next available drive letter. The UT utility that is supplied with the SC101 is a small program that can be used to list the current setup of the SC. It is also possible to list details of a particular partition and also delete them! This latter could be quite damaging where you have multiple users with the SCM software installed and you haven't changed the default password, which incidentally is password! (c) Copyright 2005 Zetera Corporation. The above listing shows two MicroSans found but in reality this is a single SC101 with two discs, each with a single partition. For each drive the list shows the total size, available size and the partition information. Note that each drive has it's own IP address as does each partition. It is therefore important to ensure that any dhcp server has enough of an IP scope to cope with the number of partitions on the SC101 and all the other devices set up to use dhcp on the network. If an partition is unable to obtain an address, then it will not appear correctly in either the SCM or thru' UT. Two other options available with the ut command are the getpart and remvpart. The getpart option displays some extra info about a particular partition, as shown below, and remvpart allows the deletion of a specified partition. Note that the output of ut on it's own shows the use of a roottoken switch. This is actually the SC101 password as discussed earlier and also shown in the getpart command below. The information from the getpart command is really not all that useful as the listall option really gives most of the important information. 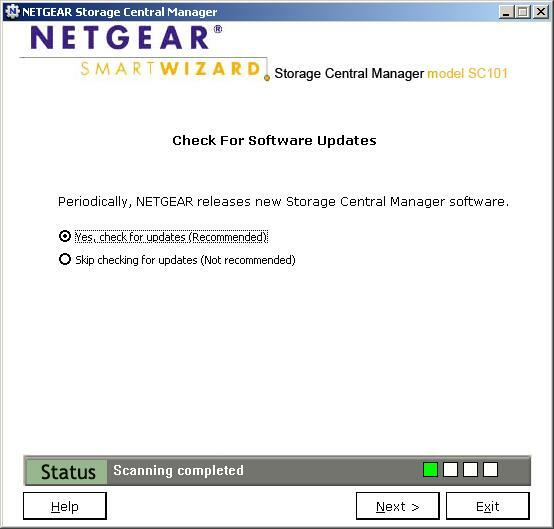 C:\Program Files\NETGEAR\SC101 Manager Utility>ut getpart 192.168.3.102 192.168. The remvpart option actually deletes the specified partition. Consider the following output of listall where a second partition, 'test', of size 20GB has been created on the second drive. Here it can be seen that the second drive now has two partitions, and this second partition has negotiated another IP address from the dhcp pool. As the test partition is not really required, it can safely be erased. This can be done using the SCM program but ut allows this to be done much more quickly by using the remvpart option, as shown below. The ut command will prompt to confirm the deletion, but that's about it as far as determining that this is indeed what the operator wishes. This is another reason to change the default password. As can be seen this is a catchall error message that covers the SC101 not being visible on the network, the specified partition not existing or the roottoken being incorrect. Whilst the SC101 is a nifty little device it does have one or two issues that can make it's operation a little frustrating. Most of these have already been touched upon in this article but it is worth reiterating some of them. Invariably, this is due to the SC101 being unable to lease an IP address for the partition. Check that there are sufficient addresses available from the dhcp server. In firmware version 4.14.0, Netgear added the function to set the hard drives to standby after approx 15-20 mins. Whilst this was a good idea to prevent the SC101 overheating, it did have the effect that some discs would not re-awaken, hence they would disappear from Windows Explorer and the only way to make them active was to re-power the unit. Not very helpful. As of writing there is not a fix for this available from Netgear. This behaviour can also cause some unusual behaviour within Windows, with Explorer and other programs hanging. 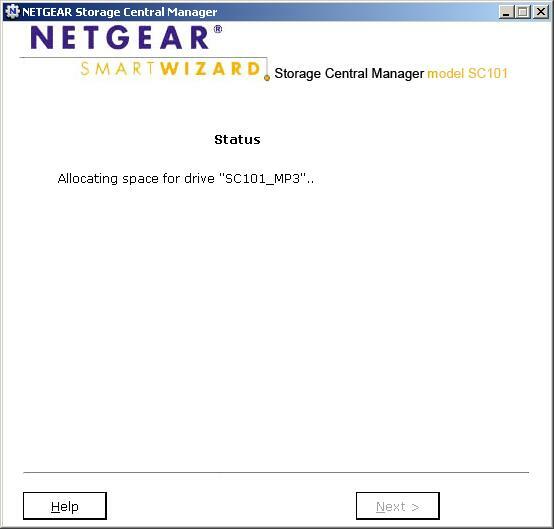 Netgear publish a list of compatible drives which are tested to work with the SC101. Whilst other drives may also work, they can have unwelcome results such as inability of the SCM to partition or format the discs. All PCs that are to use the discs in the SC101 need to have the SCM utility installed. This means that every client will have the ability to amend drive and partition information. This can be averted by changing the default password, but it still allows viewing of partition information which may not be desirable depending on the unit's deployment. 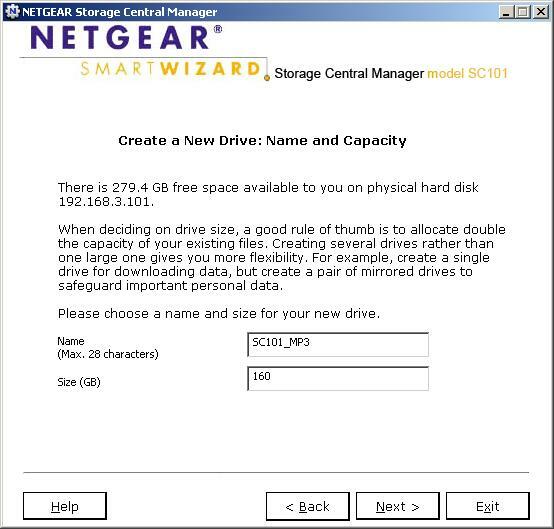 Another alternative is to use the SC101's drives as MS Networking drives thru' sharing of the assigned drives on the management PC, which will at least give a client machine read and/or write access to the data and will negate the need for the SCM utility to be installed on every PC.